Busy B Family: Party Time! 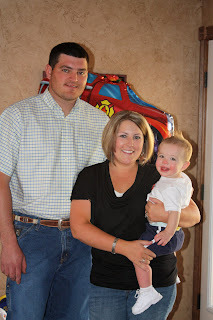 Landry's 1st Birthday party was on Sunday and we had a blast! However, the day didn't start off too well. I was in the process of making punch when Landry started throwing a fit. Now, being the good mother that I am, I gave him something to keep him occupied. That being the kool-aid container. (let me justify- it was one of those that comes in a container with like 5 or 6 seperate foil covered packets) I gave him the whole container with the lid and everything. So I go about punch making and table setting and chatting with my mom on the phone. I look over and he's got the lid off and now has the individual containers out. Once again, no big deal (remember the good mother I am?) Finish setting the table and making punch, glance behind me and see RED covering my baby. Freak out thinking he's bleeding to death, hang up on mom. Reality sets in that I'm an idiot who gave red kool-aid powder to entertain my child. Now, being the wonderful mother that I am, I took pictures first. Then I took the fun tasty treat away from my child. And s*** hit the fan. Does anyone know of anything that gets red dye out of a babies skin quickly? I obviously don't. I used vinegar, toothpaste, warm water, baby wipes, lotion and soap. 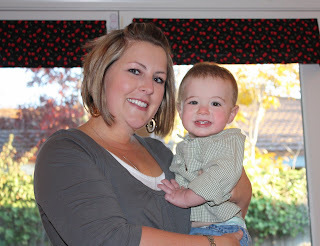 I did get it to fade a little, so in his 1st birthday pictures he looks like Rudolph. Once again, I'm a great mother. 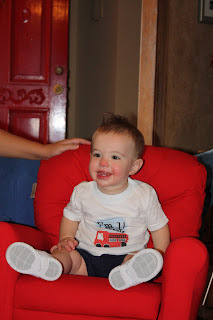 Grammy and Grampy got him this awesome firetruck car! He LOVES it! I wanted a picture of him with his big cake and what's he do? Grabs himself a handful! Then it was smash cake time! And daddy smashed the cake into Landry's face! Playing outside with his new toys! It just couldn't have been better. 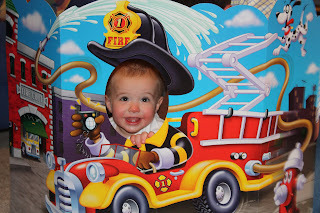 His red face and hands were perfect for the Firetruck celebration. He entertained family and friends real good with his walking in new stiff hightop shoes. His smile brings smiles to every one. Happy "First' Birthday great grandson.